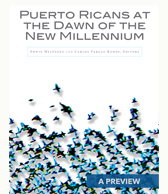 Centro’s publication Puerto Ricans at the Dawn of the New Millennium presents the most recent findings about the demographic and socioeconomic profile of Puerto Ricans in the U.S. The authors examine the impact of the migration wave from the last decade as well as the patterns of internal migration among the Puerto Rican population living in the U.S.
You can download here a PDF preview of the book that includes summaries by chapter as well as updated charts and figures with the most recent data available. One of the highlights of this online preview are the maps that illustrate migration patterns of the “old enclave” which represents movement between the long-established Puerto Rican enclaves in the Northeast and Midwest and the “new enclave” which portrays an expansion from these traditional migrant networks to the nascent Puerto Rican communities in the Southern and Western United States. We also invite you to check out this article published last week in Centro Voices, in which Harry Franqui-Rivera analyzes new data and discusses the role of military service in the establishing, spreading and the socioeconomic profile of Puerto Rican communities in the mainland U.S. Here at Centro, we are committed to producing research that represents the realities and challenges of the Puerto Rican population in the U.S. The depictions that emerge from this book are tales of resiliency amid declining opportunity and the enduring challenges faced by those still caught in the trough of the recession. The book is also a story about those who left the island for the mainland United States in search of economic opportunities and about the social contexts of the new communities throughout the United States in which they have settled.